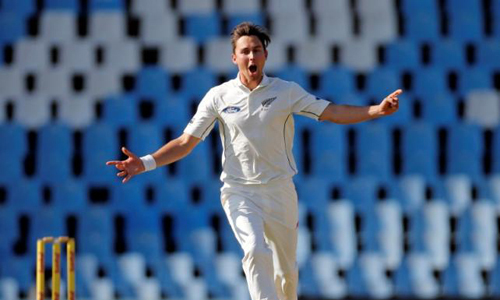 CHRISTCHURCH – New Zealand’s frontline seamers Trent Boult and Tim Southee will have their workloads managed through the limited-overs portion of their series against Bangladesh to ensure they are fresh for the rest of the international programme, coach Mike Hesson has said. New Zealand begin a three-match one-day series against Bangladesh in Christchurch on Monday, before they play three Twenty20 internationals ahead of two tests. Boult will not play the final one-day match in Nelson on Dec. 31 and miss at least the first Twenty20 match in Napier on Jan. 3, while Southee will miss the entire Twenty20 series ahead of the first test in Wellington that starts on Jan. 12. “It’s always a balancing act with guys that play all three forms, especially the bowlers,” Hesson told reporters in Christchurch on Saturday. Both played domestic limited overs cricket upon New Zealand’s return from Australia, where they were thumped 3-0 in their Chappell-Hadlee one day series against Steve Smith’s side. Most of the team had returned to their domestic sides since, with Boult, Southee and spinner Mitchell Santner all playing on Friday in Hamilton before joining the national side. Tom Latham, Matt Henry, Neil Broom and Jimmy Neesham all played for their respective teams in a Twenty20 match in Christchurch on Friday. “I think it’s been good the guys have had 10-12 days home playing some domestic cricket,” Hesson said. Captain Kane Williamson, however, had not played any cricket at all, Hesson said, with the coach restricting all contact with the 26-year-old. “It’s been nice to be able to give him a break, it’s a tough ask playing all three forms of the game and you’re captain as well. “I’ve left him alone to be fair to enjoy his break rather than getting annoying phone calls from me all the time.